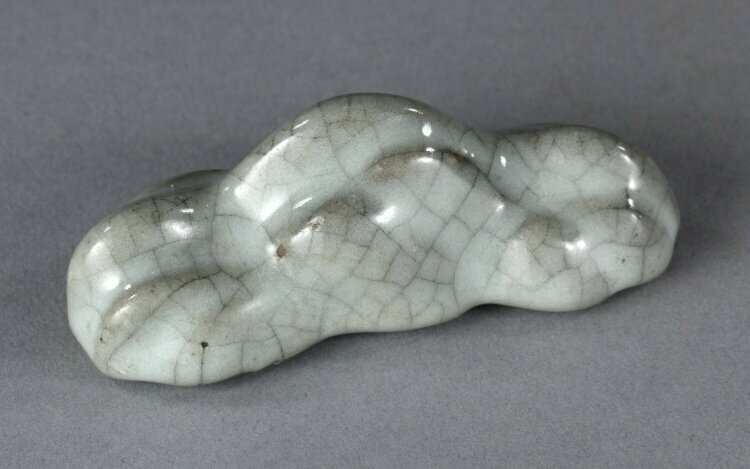 Brush Rest, Guan ware, 1127-1279, China, Southern Song dynasty © 2013 Cleveland Museum of Art. Brush Rest, Guan ware, 1127-1279, China, Southern Song dynasty (1127-1279), glazed stoneware, Diameter - h:2.80 w:7.60 cm (h:1 1/16 w:2 15/16 inches) Overall - h:6.00 cm (h:2 5/16 inches). John L. Severance Fund 1957.42, Cleveland Museum of Art © 2013 Cleveland Museum of Art. Commentaires sur Brush Rest, Guan ware, 1127-1279, China, Southern Song dynasty © 2013 Cleveland Museum of Art.